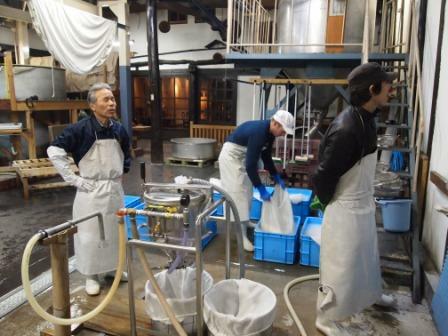 After polishing the rice, the next step in the sake making is process is washing and soaking. Washing is simple enough (if you have a nice little washer like they have here); the rice is washed in 10 kg portions for 1 min, dropped into a bag, rinsed gently for 30 sec, and is then placed into a container full of water to soak. But how long should the rice be soaked for? For rice to be used in making koji, the target amount of water to absorb is approximately 33% of the dry weight. For rice to be added into the fermentation directly(after steaming- called “kake mai”), the rice should absorb a little less water, around 29%. In the photo, Uei-san is writing down the times that rice should be placed in, and taken out of, the soaking containers. For the first bag, there is a little trial and error, with the rice being soaked, then weighed (after removing excess external water), then placed back in the water, then weighed again. For this batch of rice, which was called “Hinohikari” and was milled to 60%, it took 11 min 15 sec to soak up 29% the initial weight of water. Hope that helps answer the question! The week is off to a great start here at Daimon-shuzo. After a long bus ride, I arrived late Monday afternoon, and was kindly greeted by Daimon-san after walking through the brewery’s beautiful front garden. We chatted for an hour and were then joined by Brock Bennett, who is working for Nogne-o brewery in Norway as a sake brewer and had come to Daimon shuzo for some additional training. The next morning we got straight down business by washing the rice for the next fermtation (soe), the next yeast starter culture (moto), and the rice to be used for making koji for the tome part of the next fermentation. My Japanese is now much better after working in a sake brewery for one season, so I was able to talk to Uei-san (Daimon-san’s right-hand man) in much more detail about the various aspects of brewing than I could when I was here last. In the photo below, you can see us talking about the moto (yeast starter) that was going to be used the next day to start the main fermentation. I know it is going to be a great week here at the brewery, as everyone is eager to share their knowledge about sake. I will try and impart some of that knowledge here- stay tuned! Well, it is Sunday night (Feb. 20), and I am just about to hop onto an overnight bus headed to Osaka to start a new, small chapter in my sake training. I will be visiting my friends at Daimon Shuzo, whom I visited 2 years ago (please see the archived blogs), for several days of (hopefully) intense training. Needless to say, I am really looking forward to seeing the super-friendly brewery staff again, and learning as much as I can from them. Fortunately, my Japanese has improved since then, so communicating should be easier. It has also motivated me to revive this blog, so if there is anyone still reading the blog, stayed tuned for some posts from inside the brewery- hopefully I can share some of the things I learn.